The Master Plumbers’ Association of Tasmania is the State’s peak plumbing contractor organisation representing some 150 small to large businesses. The Association pro-actively seeks involvement in all areas affecting the Plumbing Industry to safeguard contractor interests, explore and develop commercial opportunities and protect the health and well- being of the Tasmanian community and our environment. 3. training and information exchange and networking within Tasmania. Our Members are bound by a Code of Conduct, and our Association is governed by its Constitution and an elected Board of Management with the support of the Executive Officer. Occupational Services (CBOS) implemented a CPD program for all licensed plumbers and gas-fitters under the Occupational Licensing Act 2005. The Master Plumbers’ Association of Tasmania in partnership with the Government have developed CPD Toolbox – www.cpdtoolbox.com.au , an online resource open to all plumbers and gas-fitters in Tasmania, be they members or non-members of our Association. CPD Toolbox is your one stop shop for managing your CPD requirements. You can book in to CPD activities, mark online CPD activities as completed, upload additional external CPD activities and keep a running total of your CPD points. Head over to CPD Toolbox, register as a user and start using your CPD Toolbox now! 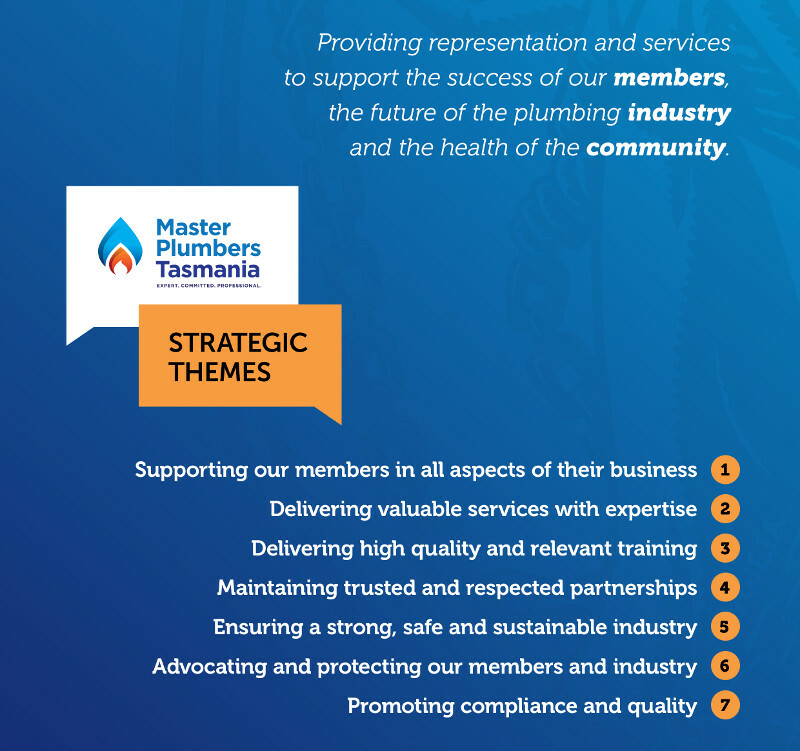 The Master Plumbers' Association of Tasmania recognises the vital role plumbing plays in developing and maintaining public health and ensuring the environmental sustainability of our communities. Our large membership represents a powerful and reputable group and we lobby on behalf of members to protect and effect change to the industry and in support of various plumbing, business and environmental recommendations. Our Master Plumbers are expert, committed and professional. They are bound by a code of conduct; are fully licensed; deliver quality plumbing services at affordable prices and are backed by the industry’s largest plumbing association. Whether its general plumbing, roof plumbing, gas-fitting or specialty areas such as solar hot water or air-conditioning – it pays to choose a Master Plumber. Did you know that 1.1 billion people lack access to a safe clean water supply and 2.6 billion do not enjoy the use of effective sanitation systems? The tragic result is 3.1 million children die each year as a result of diseases that could have been prevented if only the children had access to basic facilities, according to the World Health Organisation. There is nothing more important than clean drinking water and good basic sanitation to keep the world and the people who inhabit it healthy. World Plumbing Day (WPD) is an international event on March 11 every year, initiated by the World Plumbing Council as a means of highlighting the important role plumbing plays in the health, safety and sustainability of our community. Visit www.worldplumbing.org for more information. Our Associate Members and Industry Partners play an integral role in the support and development of the plumbing industry throughout Tasmania. Whether it is their products and tools for domestic or commercial use, new technology or business services our Partners help us ensure that our Master Plumbers are up to date and skilled in the latest advances in the plumbing industry.